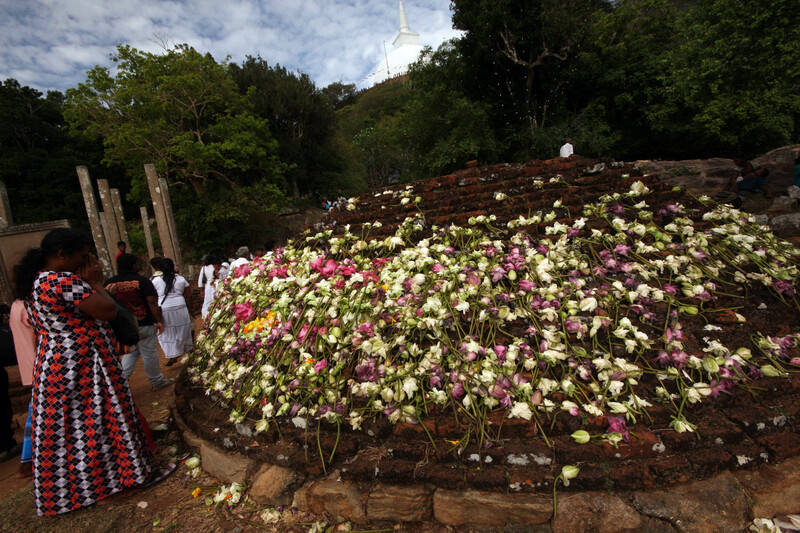 Mihintale hill is the spot where King Devanampiya Tissa of Anuradhapura met Mahinda, a Buddhist monk and son of the Indian Buddhist Emperor, Ashoka. Mahinda asked the king a riddle and when the king was able to solve it, Mahinda deemed him to be a worthy disciple and converted him to Buddhism. There are religious monuments all over the hill, and the ruins of a monastery and a hospital. 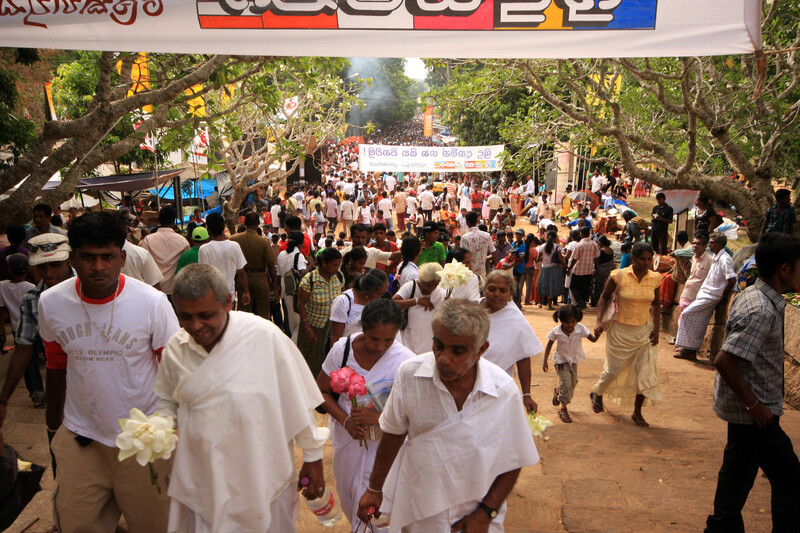 Unless you enjoy enormous crowds of people, don’t visit Mihintale onPoson <day, as I did (full moon day in June). I happened to have arrived in the area at this time and thought I may as well see what it was all about. It wasn’t unfriendly, but I found it slightly unnerving to be surrounded by thousands of Sri Lankan tourists, particularly since I visited on my own and I didn’t see any other ‘foreigners’ all day. I received a lot of attention, most of it simply smiles, stares and covert giggling at the sight of me, plus the the usual ‘where are you from?’ question. I was used to this, but the intensity of it made for a long day! Groups of over-excited young men were a particular challenge. I was made to feel even more singled out by being the only one, out of all those thousands, who was called over and asked to pay an entrance fee, of R500. Putting it in perspective, that’s just under UK£3, but in Sri Lanka R500 is worth a lot more. Of course I understand why foreign visitors must pay a much higher fee than the locals (who often, as here, pay nothing), but I still don’t like it! Thankfully, however, it seemed that the majority of the crowds were actually milling about on the streets surrounding the hill, and once I actually started climbing there were areas that were surprisingly peaceful. It’s a charming place and I would certainly have enjoyed my visit a great deal more if I’d gone on a quiet day. 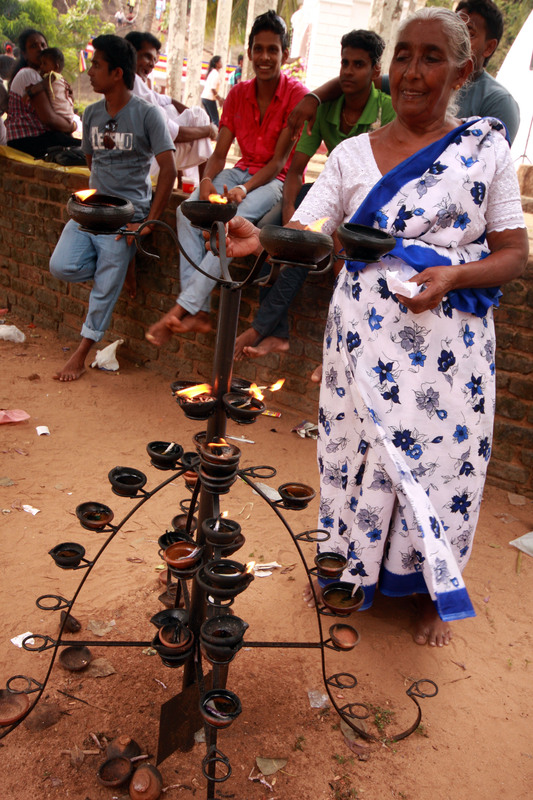 The granite steps are shaded by frangipani trees and near the top there are vendors selling products made from sandalwood, supposed to cure all manner of ailments. 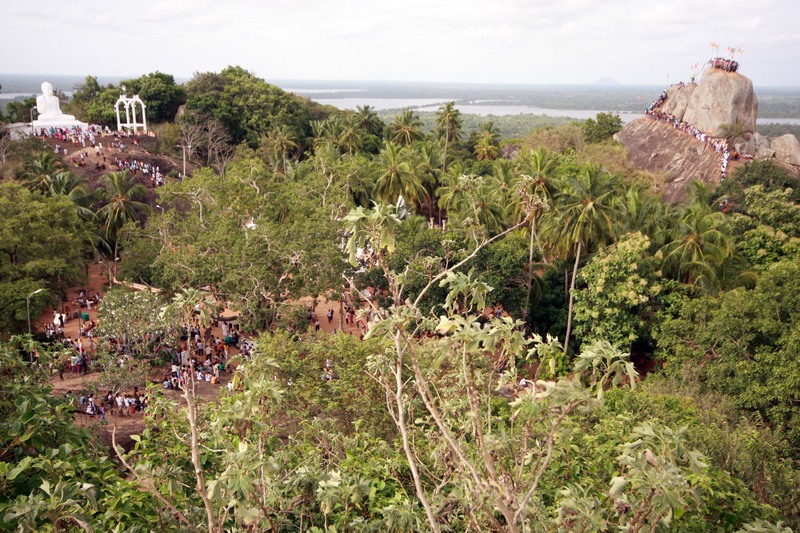 You can climb up a rock called Aradhana Gala for views over the countryside, but on this day the stairs up and the small fenced area on top were jammed with seemingly unmoving people. Luckily, there are wonderful views from theMahaseya Dagoba and I was surprised, and happy, to see that the jungle stretched as far as I could see in every direction. Getting there There are lots of buses going to Mihintale from Anuradhapura. You can catch one from the new bus station, or from any of the bus stops along Main St, heading north.